Given that its medium-term economic outlook is very similar to that of the Netherlands, Germany should take the Dutch downgrade as a warning that its triple-A rating is far from secure. In fact, with Germany’s political effectiveness, economic momentum, and fiscal position at risk, a downgrade may well be only a matter of time. 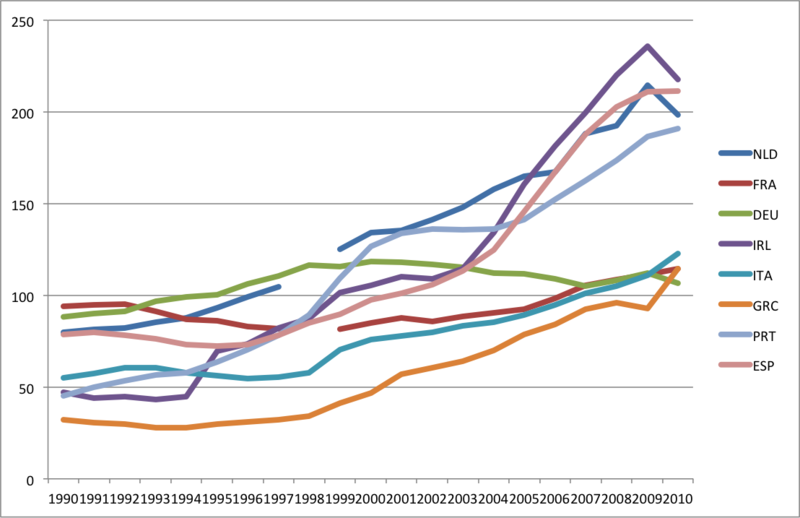 What you see in the graph is credit to the domestic sector divided by GDP (data from WorldBank) for some euro zone countries. While the usual suspects come out top and Germany ranks very low – its ratio did not move much, actually – the surprise at the time was the Netherlands (NLD). So, after its private sector went on a spending binge the party is over now, and real estate prices are falling. People start repairing the balance sheets by repaying debt, thus turning from private deficit spending to private surplus saving. Germany’s public debt is higher than the Netherlands’, especially considering that the Dutch have a natural-gas supply worth well over 20% of GDP and pension-fund savings of some €1 trillion ($1.37 trillion), or roughly 140% of GDP. And, while Germany’s fiscal position is currently much healthier than that of the Netherlands, owing to its exceptional economic performance since the crisis began, faltering output is now threatening to weaken it considerably. … then you are still using old economic thinking when pondering new economic problems. As I have said, the domestic colleagues, among them those in Maastricht and Groningen, are way ahead.